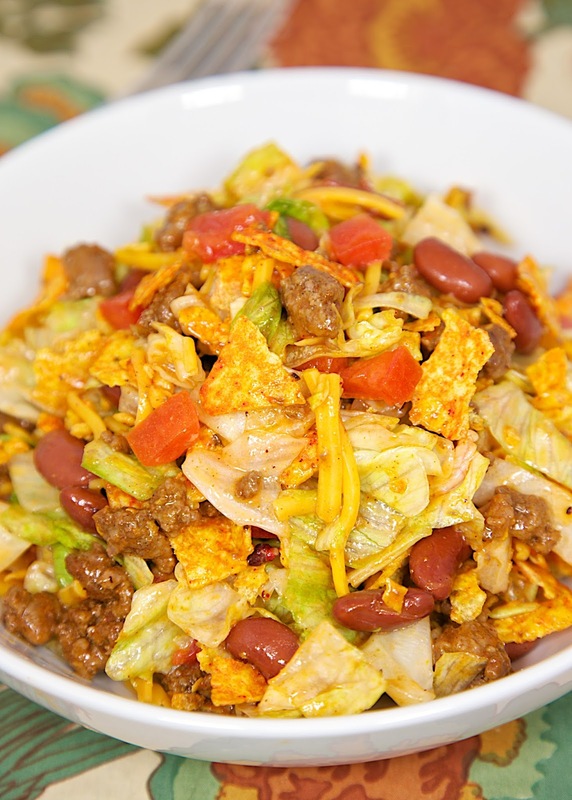 Doritos Taco Salad Recipe - taco meat, kidney beans, tomatoes, lettuce, Catalina dressing, cheese and Doritos. Quick Mexican recipe. Kid-friendly - who wouldn't want to eat Doritos for dinner?! I got this recipe is from my Mom. She used to make it all the time when I was growing up. I ate it without the lettuce, as I was not a fan. However, I was a big fan of the Doritos! I still am. They are my kryptonite. 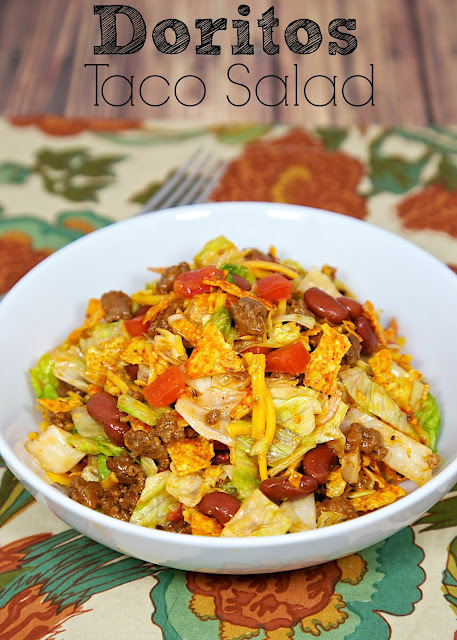 This taco salad is so simple and only takes a few minutes to toss together. The only real cooking involved is browning the taco meat. Everything else is just dumped in a bowl and tossed together. We both loved this! How could we not? Taco meat, kidney beans, cheese, lettuce, Catalina dressing and Doritos - what's not to love?!?! In a large skillet cook hamburger meat until no longer pink. Drain fat. Stir in taco seasoning and water. Simmer for 5 minutes. Remove from heat. In a large bowl, layer lettuce, tomatoes, cheese, and kidney beans. Top with taco meat. Toss with dressing. Add crushed Doritos and toss thoroughly. Serve immediately. We had this when I was growing up, too! It's been a long time since I made it though. I will have to put it on my menu. My mom used to make this, almost exactly except with tortillas chips and red onions! I love this taco salad and it looks even better with Doritos! I did end up making this - very tasty! I will make it again! Hello, Stephanie! This looks delicious! Do you have any idea of how many calories this has ? I must tell you that it has taken me 30 minutes to type this. It's so slow, and I ended up having to type one letter by letter So I will make this short. Thank you so much, love this site!! I also had this salad years ago, and loved it! I am going to make this for a ladies luncheon very soon, but I will also add chopped tomato, green onions and cilantro. Yummy! Thanks for reminding me about this excellent recipe of years gone bye. I first saw this salad at a Tupperware party in1968 to advertise their large Fix and Mix bowl. I have been making it ever since. And I still have the bowl. Wow, thank you for this blast from my past. I will be making this for my husband soon! Kate5405, that's probably where my mom got the recipe too! I grew up with it and always loved it. no, just rinse them out of the can. Did you ever try the same recipe, only replacing the Catalina dressing with Thousand Island and not using beans? To die for!! I alternate between the two recipes. I love this salad, but I have never tried it with the beans. I will have to try that. I love it with Catalina Dressing. My Daughter uses Salsa, and Sour Cream.